Cosmetic chin surgery at our Metairie, LA, practice can improve a patient’s overall facial appearance by changing the size and shape of the chin. Also referred to as mentoplasty, chin surgery may involve an augmentation or a reduction procedure. Dr. Stephen E. Metzinger often recommends combining chin surgery with rhinoplasty to help balance the proportions of the chin and nose to enhance overall results. Potential candidates for chin surgery are patients who are unhappy with the shape of their chin or feel it is out of proportion with their face. Patients should be in good overall health for chin surgery, with realistic goals and expectations. Additionally, it is important to wait until the chin has stopped growing, which usually occurs around age 20. Dr. Metzinger often recommends combining chin surgery with rhinoplasty to help balance the proportions of the chin and nose to enhance overall results. Chin augmentation can supplement your existing chin bone with an implant. 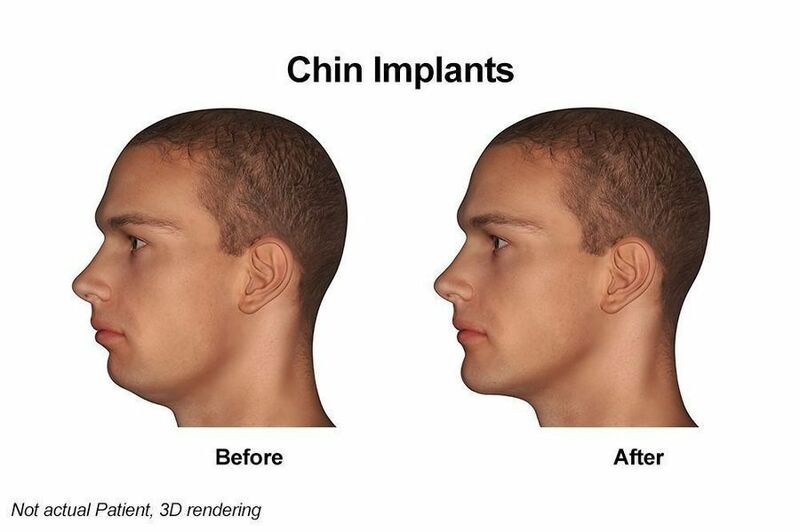 Chin implants are typically made of silicone and are shaped like a chinstrap on a football helmet. Dr. Metzinger will carve your implant to to create a custom shape and fit. During the procedure, Dr. Metzinger inserts the implant through an incision under the chin. After properly positioning the implant, he will suture it in place. The procedure typically takes 45 minutes to an hour and a half to complete, unless combined with additional procedures. Chin reduction can be performed in different ways. For example, the bone may be reduced with a polishing bur, or a section may be cut and removed. The latter technique requires a plate to hold the bone in place. Soft tissue may also be removed. Like augmentation, it is performed through a small incision under the chin. This procedure must be performed carefully to obtain a good result, and surgery takes somewhat longer than chin augmentation. The sutures under your chin will be removed within ten days. With either augmentation or reduction, you can expect some swelling, bruising, and tenderness for the first week to ten days. Full healing may take up to two months. Risks may include infection, scarring, bruising, and swelling for up to six months after surgery. In some cases, migration of chin implant may necessitate a second procedure. In rare instances, damage to nerves can result in numbness of the lip and chin. However, when performed properly, chin surgery has an extremely low rate of risks and complications. It is important to choose an experienced, board certified plastic surgeon for your procedure. Dr. Metzinger is triple-board-certified, with over 20 years of experience, and his patients’ safety is his highest priority. Most patients find that an enhanced, well proportioned facial appearance is worth the low risks of chin surgery. It is a relatively simple cosmetic procedure that can result in a dramatic improvement of your overall appearance and boost your self-esteem. At Aesthetic Surgical Associates, we offer a variety of facial cosmetic procedures that may be combined with a chin augmentation or reduction to provide you with maximum results. If you are considering chin surgery, Contact us today to schedule your consultation with Dr. Metzinger.